Over the last several weeks, we have been blogging through The Calvary Road by Roy Hession. So far, we have learned that revival is personal heart change: confession, repentance, joy, Spirit-baptism, and gospel-driven evangelism (preface). Revival is the restoration of God’s glory in his church. Revival is the manifested presence of the kingdom of God in and among his people actively bringing the lost to salvation and the lukewarm to renewed passionate devotion in Christ. The key: revival starts with me (Isa. 57:15 KJV; Hab. 3:2 KJV). I don’t wait for this big move of God–I get right with God now. In chapter one, Christian growth is defined as the Holy Spirit working through people, circumstances, and the Word of God to address self-centeredness still resident in my life. Chapter two reminds us that it’s the little sins that steal our joy. These “little foxes” keep us from enjoying the constant, conscious presence of Christ. Then in chapter three, Hession examines our need for transparency in relationships. If we want to experience on-going personal revival, we should be, as much as it depends on us, in right relationship with our family and friends. In all our struggles, failures, and lapses in holiness, we must go to the Cross for forgiveness of sin, cleansing from sin, renewal in grace, and power for victory. Chapter four points out that daily choices matter: these choices are the difference between sinning and abiding in Christ (John 15:5). 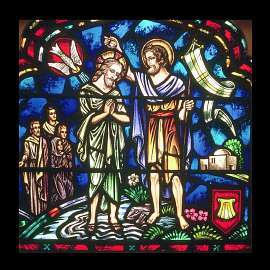 Today begins a reflection from chapter five: the Dove, the Holy Spirit, rested upon the Lamb, Jesus Christ, at his water baptism (Matt. 3:13-17). The Dove speaks of peace and the Lamb is a picture of total submission. When the Dove honors the Lamb, you and I see with our eyes that “the heart of Deity is humility” (pg. 58). The main lesson of this incident is that the Holy Spirit, as the Dove, could only come upon and remain upon the Lord Jesus because He was the Lamb. Had the Lord Jesus had any other disposition than that of the Lamb – humility, submissiveness and self-surrender – the Dove could never have rested on Him. Being herself so gentle, she would have been frightened away had not Jesus been meek and lowly in heart (pg. 58). God is brilliant, yet he speaks to me in simplicity and with great tenderness. God is all-powerful, yet he waits for a response from me to his love. God is perfect, yet he does not expect perfection from me. God is all knowing, yet he never grows impatience with my ignorance and inability to understand. God is truly humble: he became God incarnate in human flesh in order that you and I might know him. If God in his essence is humility then we are called to a life of yieldedness and brokenness to his will. Here, then, we have pictured for us the condition upon which the same Holy Spirit can come upon us and abide upon us. The Dove can only abide upon us as we are willing to be as the Lamb. How impossible that He should rest upon us while self is unbroken! The manifestations of the unbroken self are the direct opposite of the gentleness of the Dove. Read again in Galatians 5, the nine fold fruit of the Spirit (“love, joy, peace, long suffering, gentleness, goodness, faithfulness, meekness, self control”) with which the Dove longs to fill us! Then contrast it with the ugly works of the flesh (the N.T. name for the unbroken self) in the same chapter. It is the contrast of the snarling wolf with the gentle dove! (pg.59). Being continuously filled with the Holy Spirit (Dove) means that the blood of Christ has cleansed us. We are abiding in Christ (Lamb) in brokenness and yieldedness to his will. The result of a humble heart is a life that enjoys God’s constant peace, “Thou wilt keep him in perfect peace, whose mind is stayed on thee: because he trusteth in thee” (Isa 26:3 KJV). “The sign of the Spirit’s presence and fullness will be peace” (pg. 66). Peace is a rest and repose of the heart that knocks out all disturbing and disruptive forces, which would steal our fulfillment in Christ. This peace pervades my being when I hold steady trusting the faithfulness of the Father. I receive Christ’s peace for he is the Prince of Peace (Isa. 9:6) into the deepest recesses of my spirit. I have peace with God through faith in his shed blood (Rom. 5:1), which establishes peace with others (Eph. 2:14), while freeing me to trust his peace (Isa. 26:3), and as a result, I can now walk in peace in the midst of my greatest needs (Phil. 4:7). Lord, let us be people of peace both inwardly and outwardly. Let our lives reflect the humble God that you are and always will be. Father, Son and Holy Spirit in us, we pray. This entry was posted in Abiding in Christ, Roy Hession, Sanctification and tagged Abiding in Christ, Roy Hession, Sanctification on January 31, 2009 by GlennDavis.